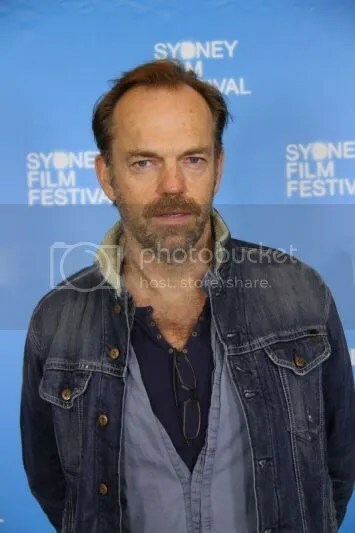 I know it’s been a long time between entries; Hugo Weaving has been busy preparing for his next role in The Mule (and for Sydney Film Festival jury duty), so there’s been little in the way of breaking news of late, but that should change very soon. The film already has a Twitter/Instagram account and promises photos and videos from the set soon… nothing yet, but I’ll keep you posted. 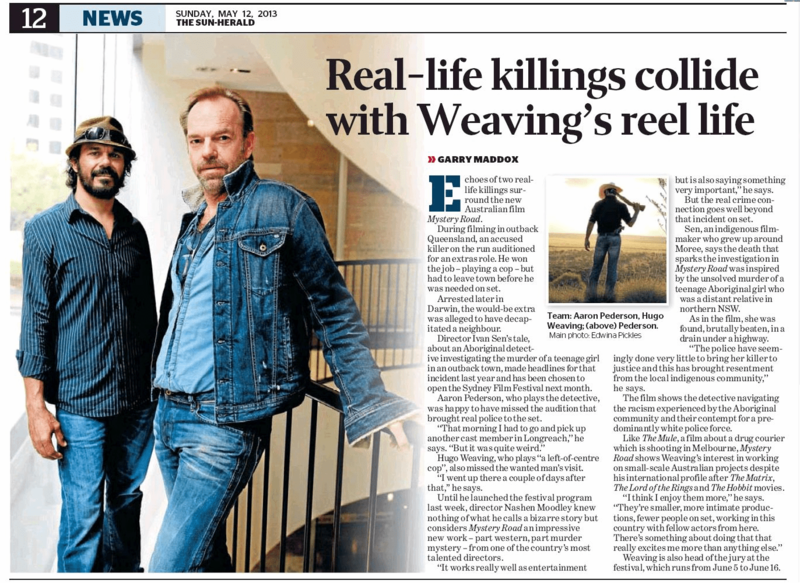 A few Hugo-themed print articles narrowly missed by previous post, so I’ll add them here… the first originally appeared in the Hobart Mercury on 11 May and features Hugo Weaving’s SFF press conference comments on what he knows so far about Mystery Road and why he’s looking forward to the SFF. 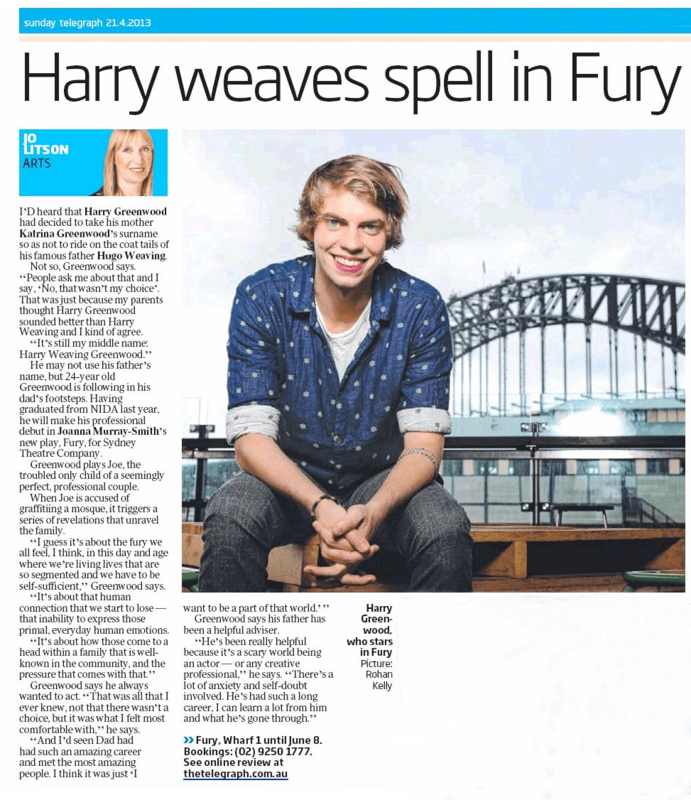 The second piece is the Sunday Telegraph’s great April 21 interview with Harry Greenwood on the occasion of his STC debut in Fury. 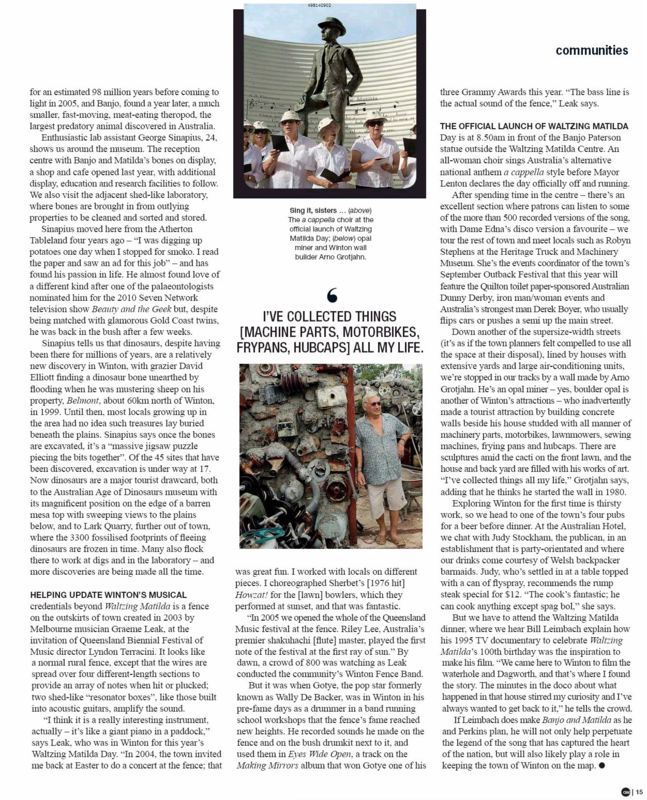 He also discusses his famous (middle) name and is refreshingly honest about the influence of his parents on his career. 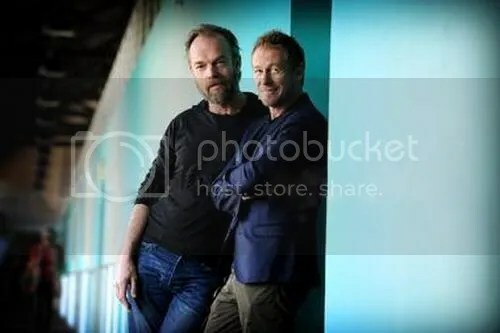 Note: I’ve recently begun posting my snapshots of classic Hugo Weaving digital articles to my personal LJ as I back them up at Flickr. Since I post links/content from the originals here when they’re new, I’m not reposting that material here to avoid redundancy… but if you missed anything the first time around or just want to revisit old favorites feel free to check it out. You don’t need to “friend” or “like” me or anything. 😉 I’ll post links to new content at Twitter whenever I add anything. Cloud Atlas was released on DVD/Blu-Ray on May 14 in the US, and quickly ascended to the top of the sales chart (more detail at The Hollywood Reporter and Contact Music). You can read well-written new reviews of the film and its home release features at I Am Rogue, PopMatters, Daily Motion, The Nerdist, Aisle Seat, Cinema Blend, Yahoo Movies, Movie Fanatic, Rotten Tomatoes, Gazettes.com, Rev. 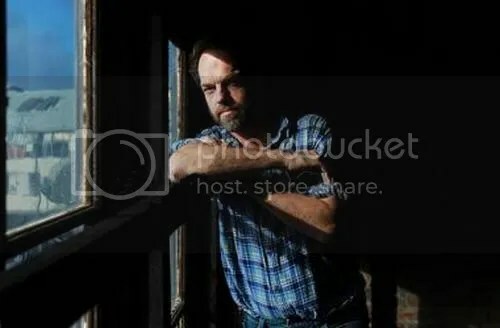 Ron’s Movie Blog, HamptonRoads.com, My San Antonio, Daily News, Scorecard Review, White Buffalo, Flick Filosopher, Forrest Hartman, JoBlo.com, WorldNews.me, Movie City News, The Video Station, Depressed Press, Foster on Film, Age of Uncertainty, Subtle Water, Boston Bibliophile and I’ve Seen Films. Great to see this film finally earning some respect, though I wish more US viewers had come to see it in theaters. If anything deserves big-screen study, it’s this film. You can also hear some exclusive soundtrack excerpts not included on the official release (and read an interview with co-scorer Reinhold Heil) at Tracksounds. Peter Jackson announced that “pick ups” for the third Hobbit film (and possibly reshoots for Smaug) were about to commence on . 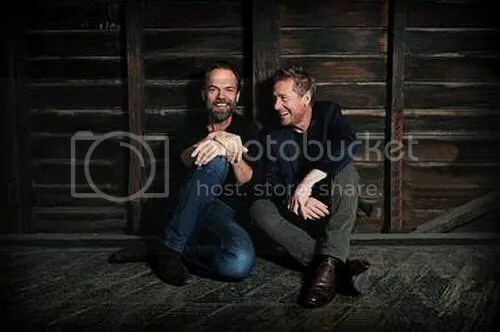 Though he promised an update “soon” (and shared a cheeky pic of himself and Gandalf/Sir Ian) there are no details or specifics on which actors/scenes will be filmed… yet. 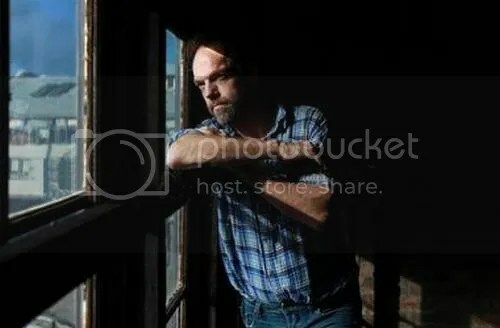 But watch this space and TheOneRing.net… and of course PJ’s Facebook page. I Am Rogue and Nuke the Fridge, among others, speculate on what might be filmed in the next few weeks, with the Battle of 5 Armies topping everyone’s Wish List. But nothing is yet confirmed, nor do we know if Hugo will be required on set, or if he’ll appear in all three films. Hugo repeatedly confirmed involvement in the first two films before a third was announced, but since then hasn’t been able to tell us more. He has so far spent only “about three weeks” filming scenes for the first two films (in April 2011), plus visits to NZ for some ADR … he hasn’t been reported on set recently, and is obviously busy on at least two other projects at the moment. But if I know Peter Jackson, these “few weeks of pick-ups” might well carry on through the summer. So we’ll have to wait and see. In the meantime, you can peruse some elegant fanart featuring Elrond and other characters (Thorin, Smaug, etc) at Flicks and Bits. FASHION ALERT! 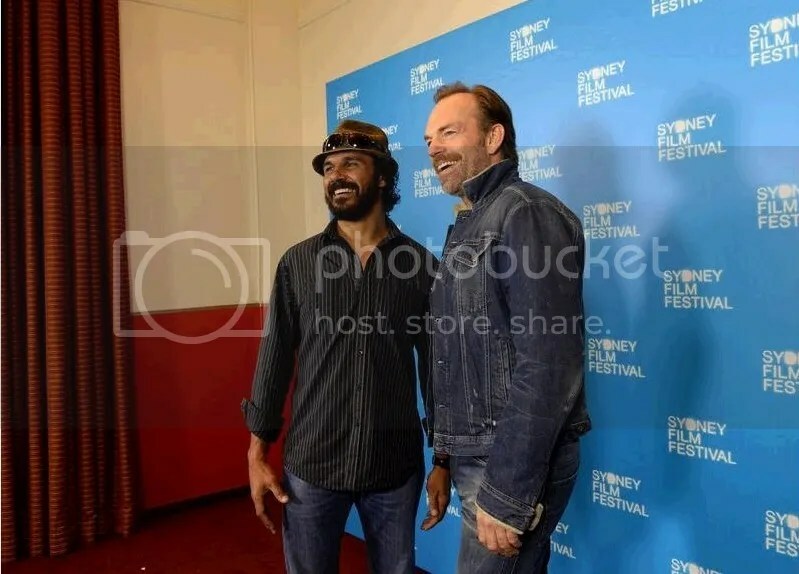 Brigalow Country has posted a nice new still from Mystery Road featuring Hugo and Aaron Pedersen. Apparently they supplied the belts. I’m not usually one to go in for product tie-ins, but until official stills are released, I’ll add whatever images from the film I can find. They also have a pic of Ryan Kwanen with Pedersen. 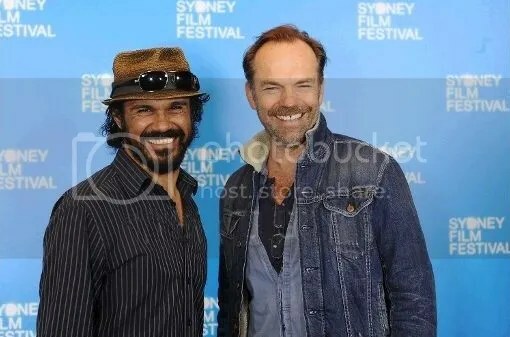 That’s all for now, but news on The Mule (or The Hobbit… or Mystery Road) might appear at any moment, so stay tuned. Rehearsals for The Mule going well. You know its going to be a great production when the quality of biscuits is this good. That second one…ouch. 😉 But it confirms we’re dealing with a black comedy. And who knows what’s in those biscuits…. Unfortunately, unlike most papers/sites covering the event, SMH decided to overemphasize the bizarre “murder suspect extra” incident which was already given too much attention in the press at the time it occurred last August, and which happened when neither Weaving nor Pedersen was on set, despite SMH’s sensationalist headline. 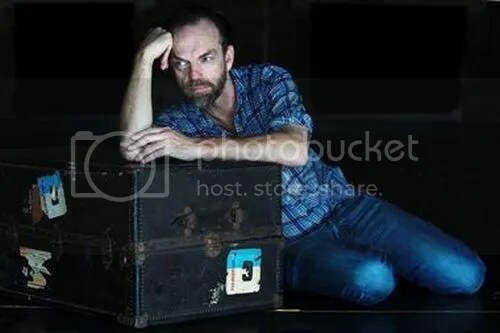 (This didn’t stop the reporter from asking both about the incident: ”That morning I had to go and pick up another cast member in Longreach,” said Pedersen, ”But it was quite weird.” Hugo Weaving adds, “I went up there a couple of days after that.” ) Director Sen noted that the film was based in part on a real, unsolved murder of an Aboriginal girl which he says wasn’t as thoroughly investigated as it should have been. The article itself is fine once you get past the tabloid element, which has little to do with the film itself, which is a serious-minded, thoughtful endeavor rather than an exploitation flick, by all accounts. 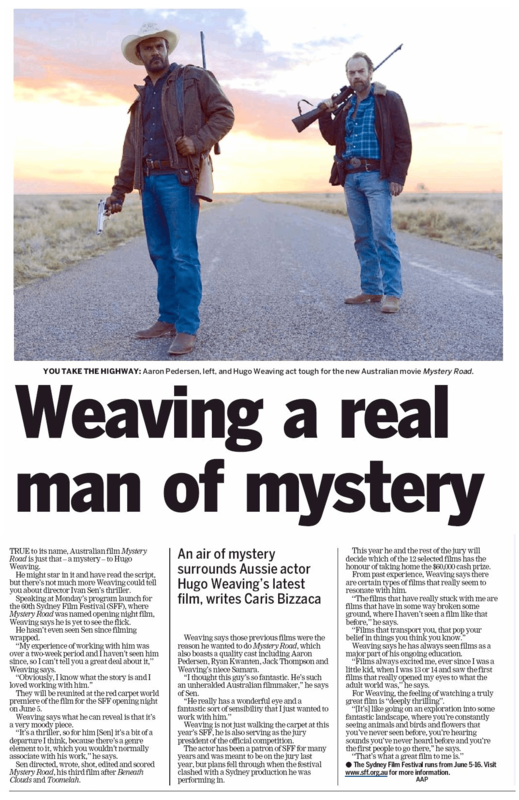 I’ll add the full text scan of the print version below, since it features a larger version of the photo, along with a scanned article about the SFF launch from The Daily Telegraph (published 9 May) which includes a new still of Weaving and Pedersen from Mystery Road. You can read more about Mystery Road and SFF 2013 at Film Junkee (which lists it atop its selection of 10 Films To Watch At The Sydney Film Festival) and abc.net.au. The film also has a Facebook page featuring lots of amazing photos and anecdotes from last year’s shoot, though no Hugo pics as yet. 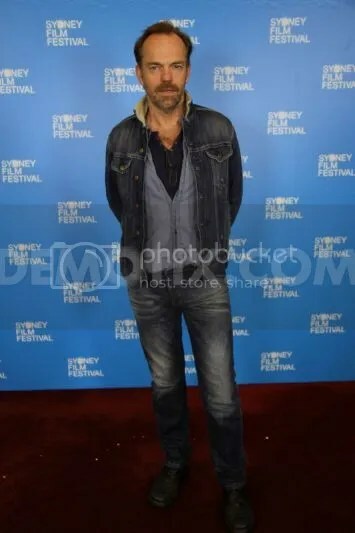 And the Sydney Film Festival has posted a digital brochure highlighting all of the films featured this year. 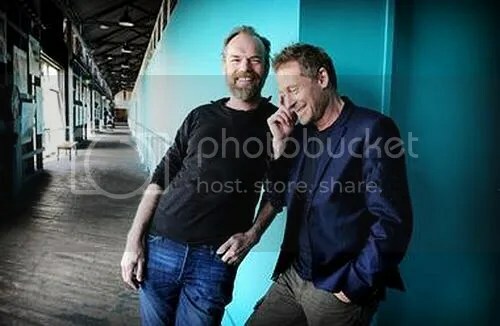 We’re continuing to learn a few new details about The Mule, which will soon be filmed in Melbourne (it’s currently in pre-production); we still haven’t been given specifics on Hugo’s role (ie whether he’s the “mule” in question or not) but The Hollywood Reporter confirmed John Noble’s casting and described his role as “a natural-born criminal who owns a local hotspot that is a cover for gambling and drug distribution.” I’m already thankful Hugo wasn’t given that role, as he’s been there and done that a few times (most recently in The Tender Hook.) THR adds that the film is aiming for a tone similar to the Coen Brothers’ Minnesota-noir classic Fargo… certainly I admire the aspiration. And Hugo has mentioned he’s always wanted to work with the Coens. Right now I’m just hoping that Noble and Weaving aren’t pitted against one another as rival drug lords who must be outwitted into destroying each other by Leigh Whannell’s lead character. That wouldn’t be Coen-esque, but a clichefest. 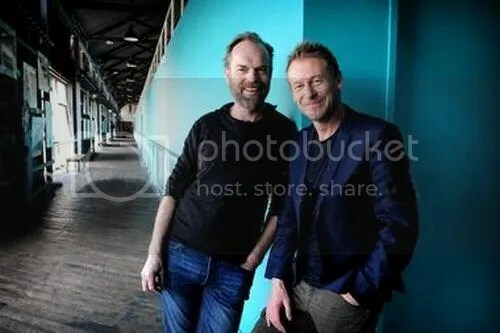 Also, who’d want to cheer on anyone instead of Hugo Weaving or John Noble? 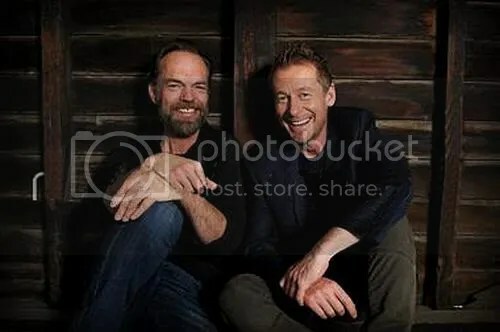 😉 The film will shoot some scenes in Bangkok as well as Melbourne… it’ll be interesting to see how this film compares to Hugo’s three drug trafficking-themed TV miniseries of the late 80s-early 90s: Bangkok Hilton, Dadah is Death (AKA Barlow and Chambers: A Long Way From Home) and The Bite. Finally, Cate Blanchett and Andrew Upton are working to make Sydney theatre-going more affordable, with a plan to reduce some Sydney Theatre Company play tickets to only $20, including those for Blanchett’s upcoming collaboration with Isabelle Huppert in The Maids, and Hugo Weaving and Richard Roxburgh’s teaming in Waiting for Godot at year’s end. More details at Limelight… Now, if they could only implement $20 airfare to Australia, I’d be right over. 😉 But Sydney-area fans should be thrilled about this. Apologies for the lack of updates in awhile, though things have been fairly quiet lately until last night. 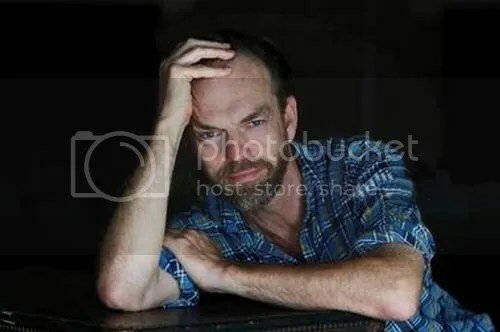 I’ve had a difficult month for many reasons, but I hope the worst of that is over. But we’re finally getting some welcome news on several of Hugo’s recently completed films as well as the next one to film. 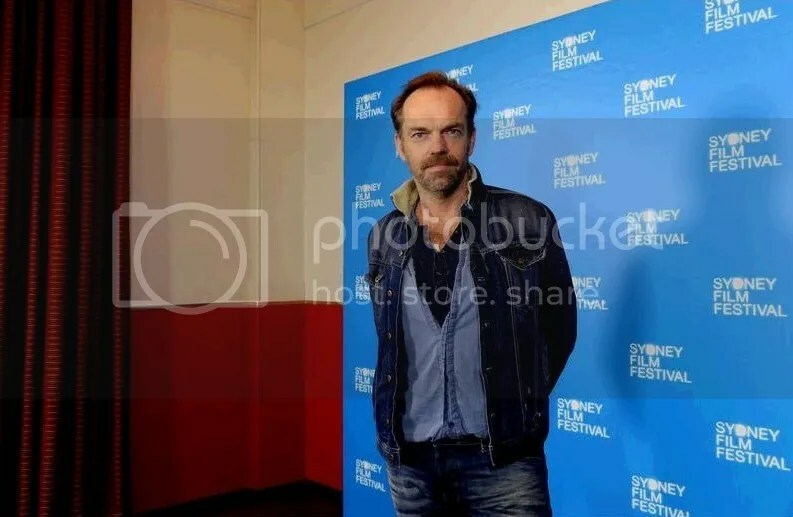 Hugo has given his first media interviews in a few months in conjunction with the announcement that he will serve as president of the Sydney Film Festival jury. 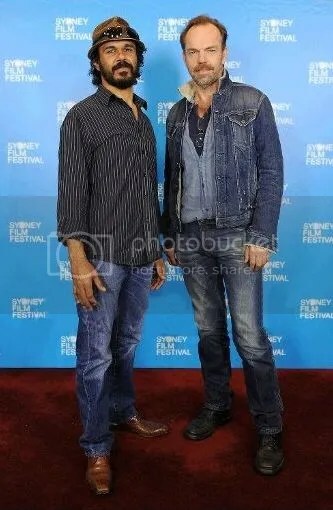 This year’s SFF will also feature the world premiere of Ivan Sen’s film Mystery Road, costarring Hugo, on its opening night. (The film isn’t in competition, so there’s no conflict of interest.) 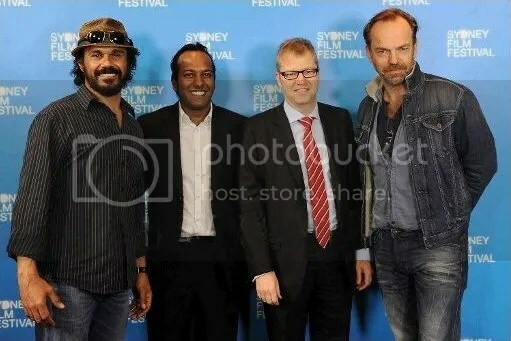 😉 Hugo Weaving, Aaron Pedersen (the lead actor in Mystery Road) and Festival Director Nashen Moodley all gave video interviews to SBS during a press conference/SFF preview announcement yesterday; I can’t directly embed from SBS, but fortunately Hugo’s interview was cross-posted to YouTube by World News Australia. He discusses Mystery Road and his interest in collaborating with Ivan Sen. We also see our first glimpses of the film (which also stars Ryan Kwanten and Jack Thompson) — presumably the footage is from the trailer. You can also see Aaron Pedersen’s interview on YouTube. I’m sorting through dozens of articles about the SFF and 2013 festival announcement; many repeat the same essential information or the SFF press release. SBS had the only video interview with Hugo (so far) but he spoke to several reporters. 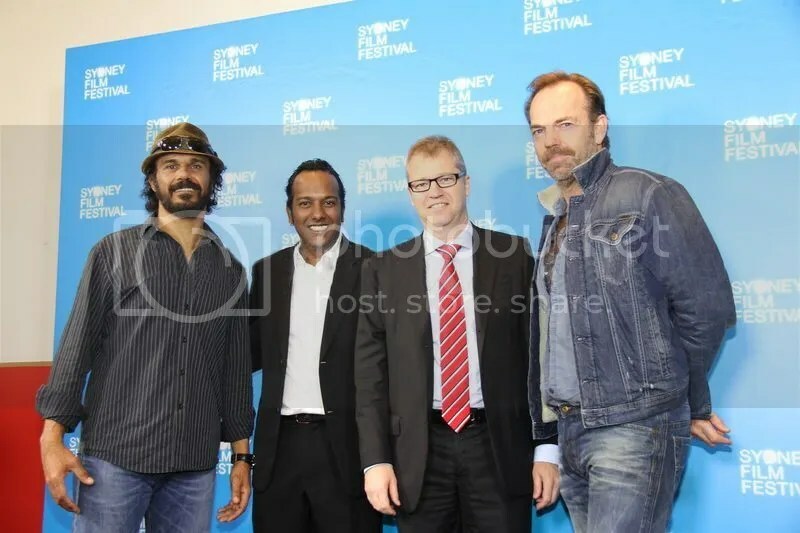 All of the interviews were about Mystery Road and the upcoming festival, which runs June 5-16. 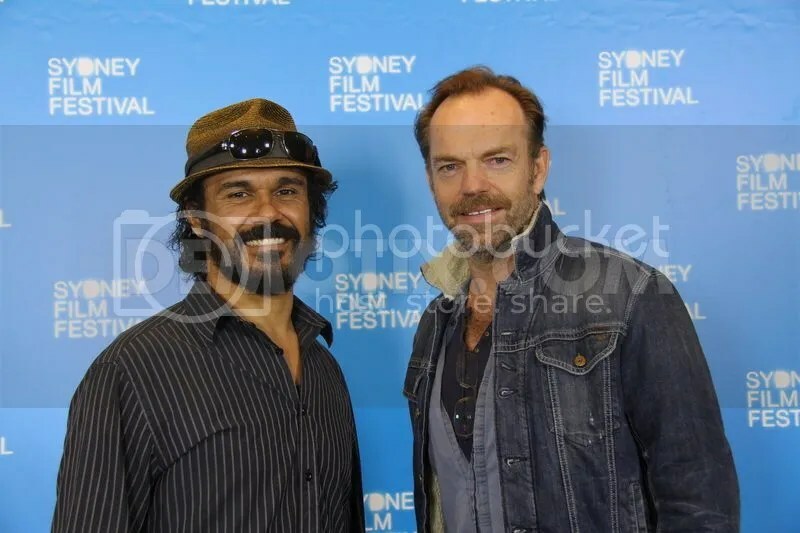 The premiere gala for Mystery Road is on June 5; tickets are on sale via SFF’s website if you’re in the Sydney area, but you should act fast. According to SFF, most of the main cast and Ivan Sen, who “wrote, directed, shot, edited and scored” the film (take that, Tom Tykwer!) will be in attendance. AAP/Local Today angled for exclusive details about the film, but Hugo couldn’t help them, as he hasn’t seen the finished product or spoken to the director recently: “My experience of working with [Ivan Sen] was over a two week period and I haven’t seen him since, so I can’t tell you a great deal about it…Obviously, I know what the story is and I loved working with him. 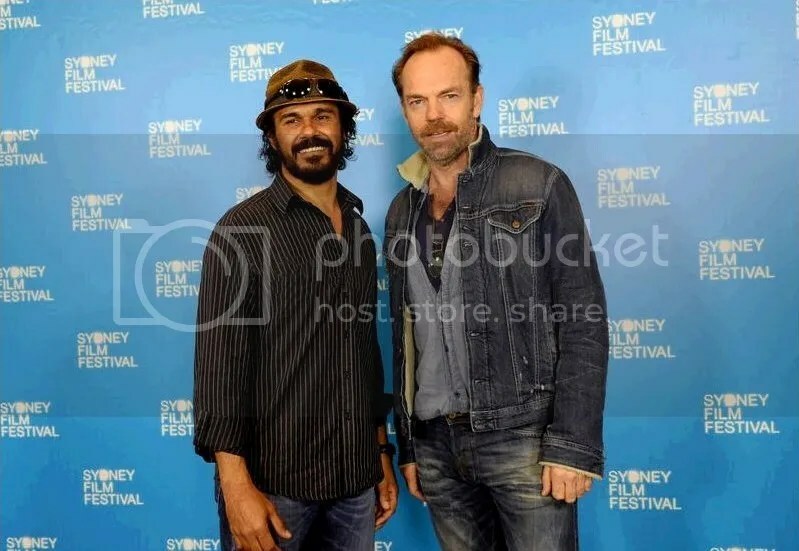 On Mystery Road and working with Ivan Sen: “Beneath Clouds is one of my favourite Australian films. I thought that was such an astonishing and beautiful film, and showed a filmmaker with such an exquisite eye and sense of timing. Then I saw Toomelah at Sydney Film Festival a couple of years ago, and I thought that film was so unheralded by the industry here. 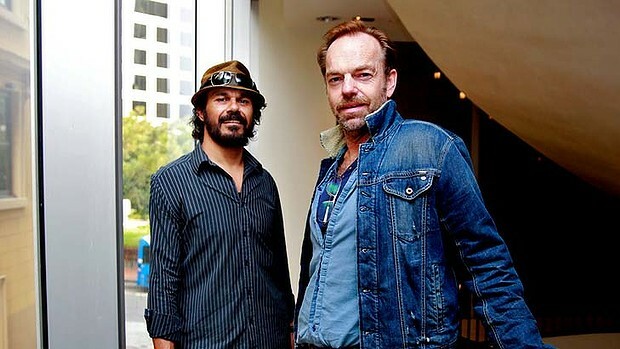 He’s an extraordinary filmmaker and I was very keen to work with him, and I actually put out feelers! 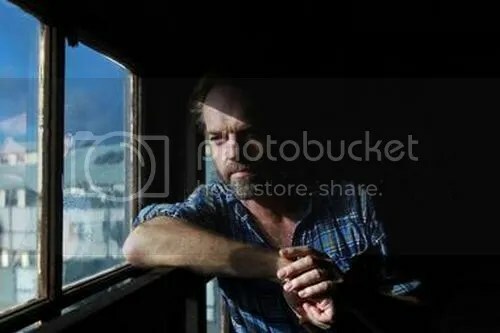 Lo and behold, the script for Mystery Road came back and it was a real thrill. 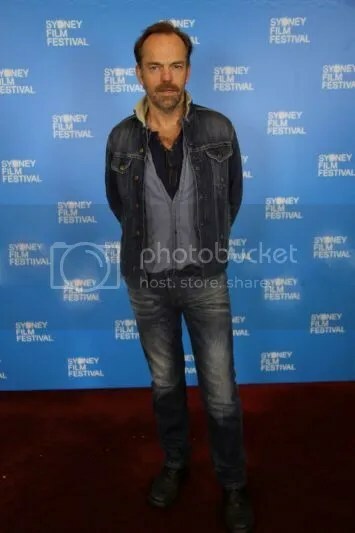 You can read additional overviews of the Sydney Film Festival and the films showcased at The Hollywood Reporter (which really, really needs to find a new photo of Hugo! ), Music News Australia, Screen Daily, The Daily Telegraph, The Australian, Twitch Film, AFP/ChannelNewsAsia, news.com.au, The Newcastle Herald and Empire Online, which features the festival’s trailer. AFP quotes Hugo as adding the following about the SFF opportunity: “”Having keenly attended the SFF for many years, always with the eyes of a somewhat excited and hungry child, it will be a great pleasure and honour for me to take up the position of jury president.” Longterm fans know that Hugo is almost always in attendance at the annual festival unless work prevents him; organizers had wanted him to serve in this role last year, but the New York engagement of Uncle Vanya prevented it. (Can’t complain too much about that.) 😉 In a recent entry I posted a selection of photos from SFF’s new online archive of some of Hugo’s prior appearances, but he’s been photographed there many times as a patron, judge, promoting his own films and enjoying the work of others. This year promises to feature all of the above. 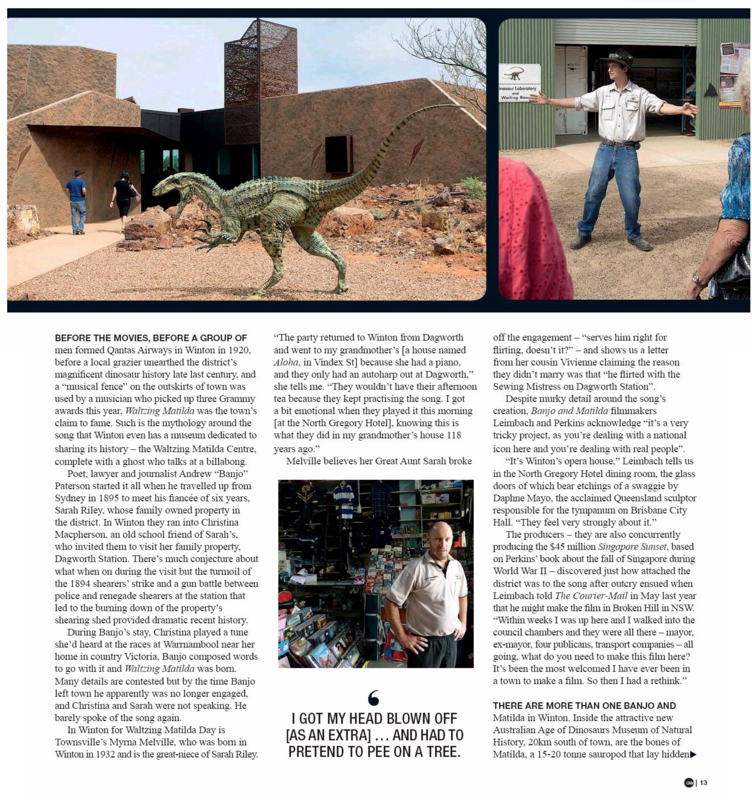 More details will be added as I continue research, but fans will want to keep tabs on SFF’s website and Twitter feed. 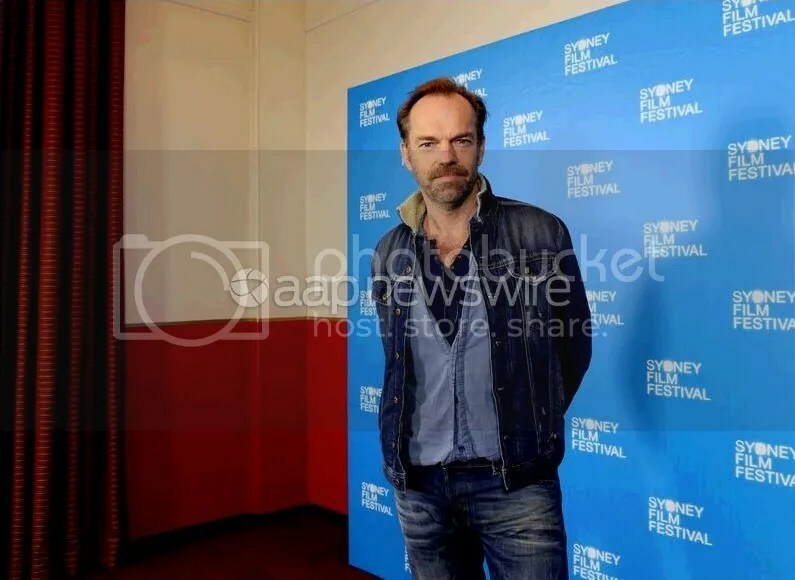 Hugo’s other major film with a festival slot this summer will be The Turning, based on Tim Winton’s collection of thematically linked short stories. It will debut at The Melbourne International Film Festival. Hugo is featured in a segment entitled “The Commission”, directed by friend and frequent costar David Wenham. Cate Blanchett also directed part of the film. 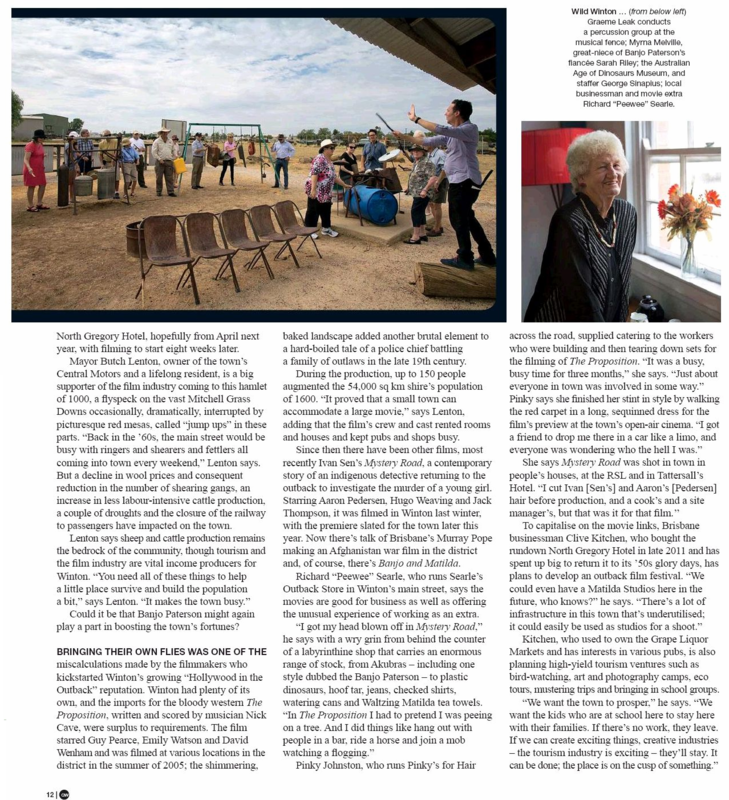 According to The Australian, the festival edit of the film runs three hours “with an intermission” and features 17 segments. Earlier reports suggested that the film might be edited down for commercial release with the deleted sequences restored for the DVD/BluRay issue, but this suggests that plan was wisely scrapped. Level K is the international distributor. 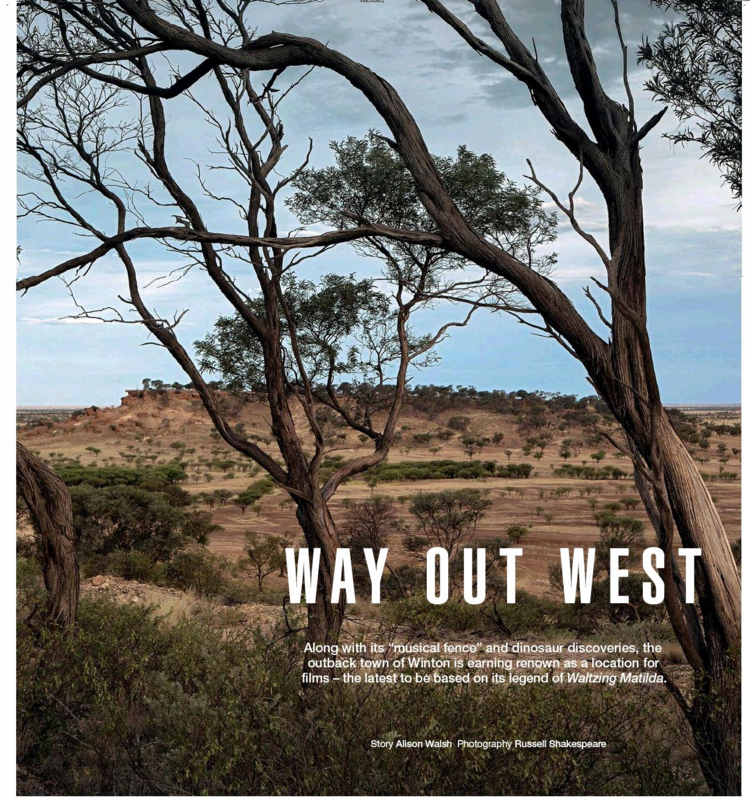 (Their blurb: “Seventeen extraordinary Australian directors respond to the hauntingly beautiful collection of short stories by Tim Winton. Spanning 30 years, these stories revolve around the turning points in the lives of the people of the coastal town of Angelus. 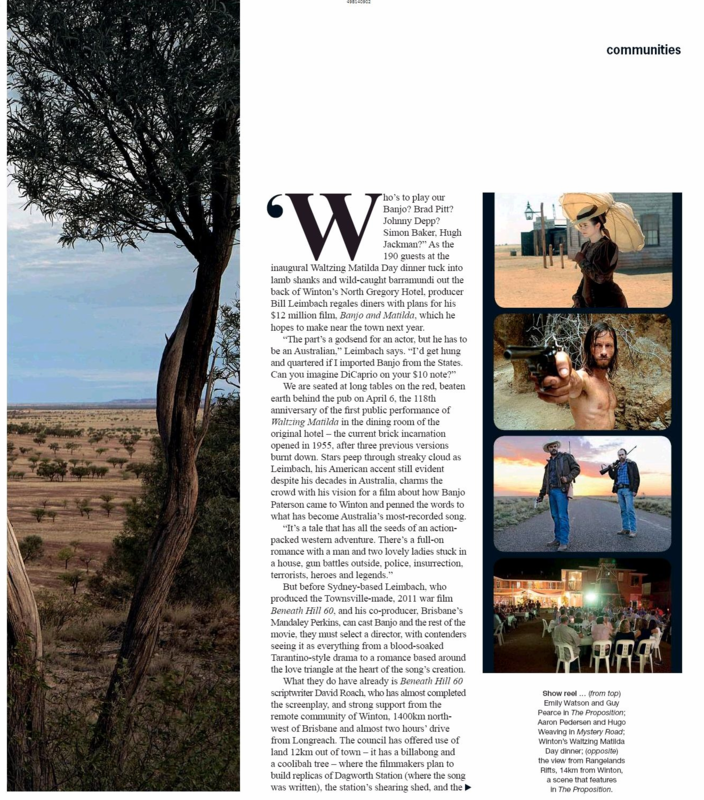 Linking and overlapping, the stories create a stunning portrait of a small coastal community in Western Australia. As befits the title of the film, the stories are preoccupied with the extraordinary turning points in ordinary people’s lives. 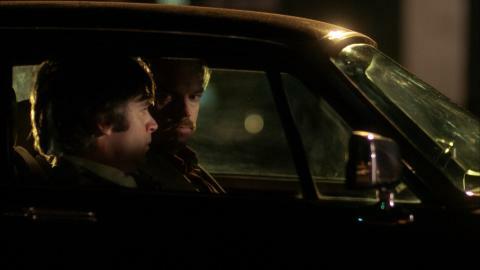 Relationships irretrievably alter, resolves are made or broken, and lives change direction forever.”) MIFF runs July 25-August 11; the specific lineup hasn’t yet been announced, nor have the specifics on The Turning’s cinematic release. We still don’t have a lot of information on Hugo’s next project to film, the crime drama (or, according to some reports, black comedy) The Mule. 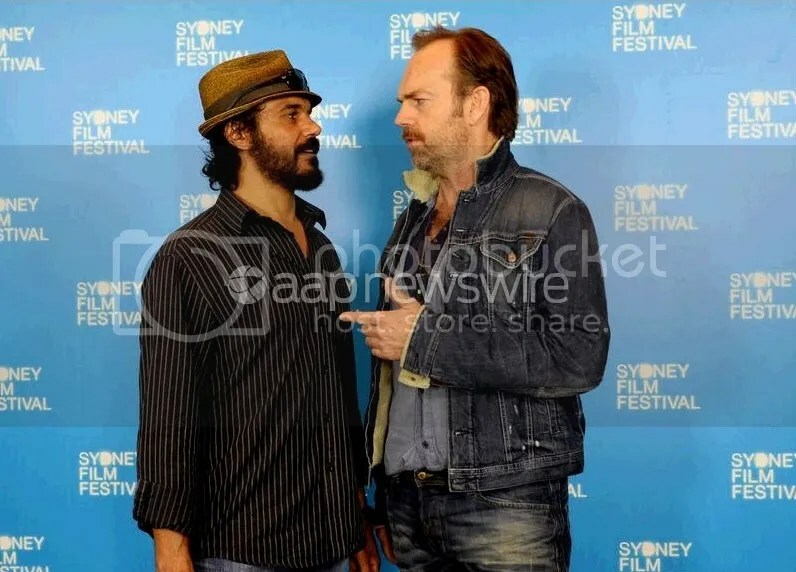 There’s still a lot of confusion over whether Hugo plays the title role or merely “a lead role”, which actually might turn out to be a prominent supporting role (see also: Mystery Road… and probably Healing). But we do know John Noble (Lord of the Rings, Fringe) has signed to costar, which is very good news. Noble tends to be cast as brainy and somewhat…eccentric authority figures, but we haven’t been told much about his role in this production. Probably won’t be a mad scientist, though. 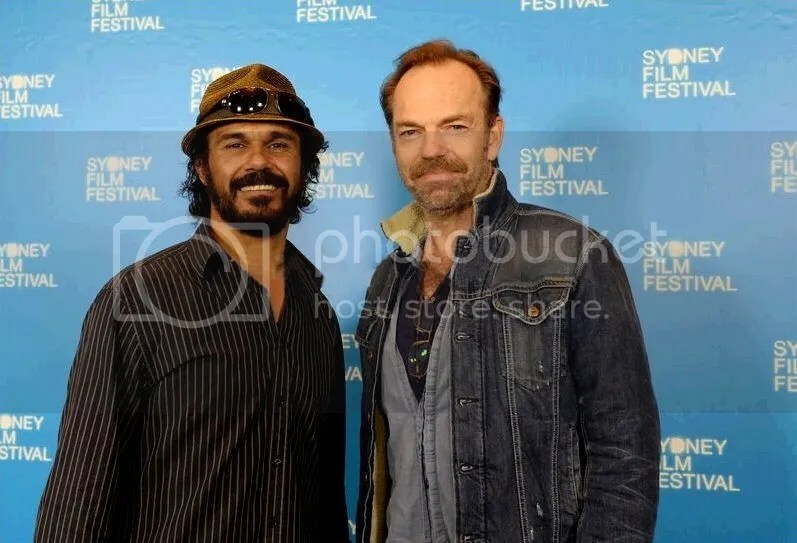 (Unless they want to use a Breaking Bad angle on drug production, heh heh…) Twitch Film announced Noble’s casting, and they seem to think Hugo indeed will be playing the drug mule in question. But they also announced, earlier, that Leigh Whannell wrote that role for himself. So… we still don’t know. I really hope there’s creative casting, regardless of who plays what. 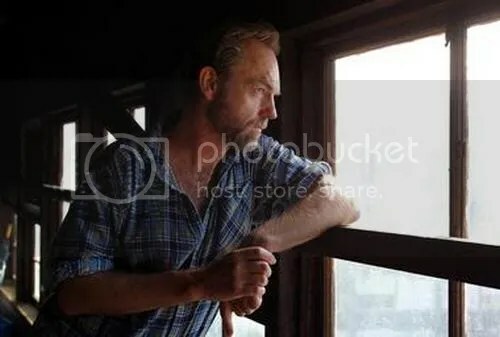 I’d also humbly suggest a change in title for the film, as there are a dozen other movies out there already going by The Mule, most of which are about drug smugglers. (A few are about burros.) 😉 The most recent was a direct-to-video thriller staring Sharon Stone. 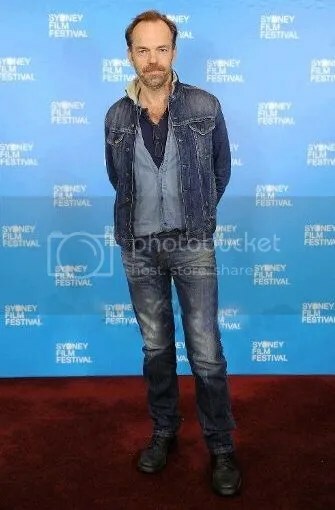 Midland Express posted a short piece on Hugo’s film Healing (costarring Don Hany), confirming filming is indeed complete. A detailed list of locations is also provided. Healing is now in post-production and will open in Australia at the beginning of next year, possibly after festival appearances this fall. Richard Armitage mentioned that he enjoyed working with Hugo Weaving and Cate Blanchett in the Hobbit films (though he never met Blanchett on set) in an AAP/Local Today interview promoting the DVD release of An Unexpected Journey: ““[Hugo and I kind of became chum…I think he really enjoyed that transformation and revisiting Elrond, what, 12 years later was kind of amusing for him… Thorin and Galadriel (Blanchett’s character) don’t meet but when I watched the movie and I heard Galadriel say Thorin’s name and it sent a chill down my spine. It felt so special that she was saying my name, because her character is just so ethereal and a goddess.” He also volunteered that The Battle of Five Armies is scheduled to shoot later this year and that he anticipated involve ten weeks of filming, but he couldn’t share specifics on who else might be filming more scenes, or when. 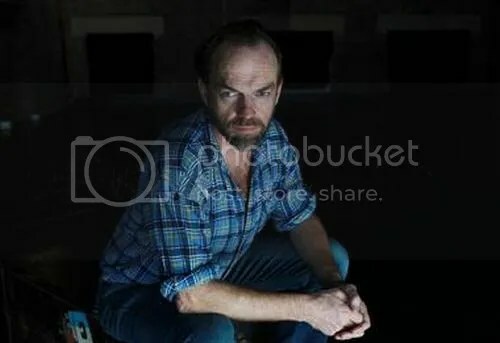 I’ve posted several video interviews with artist Del Kathryn Barton, who’s striking portrait of Hugo Weaving won this year’s Archibald Prize… but this more recent one is by far the best. Barton not only shares details of her working and conceptual process, but some fascinating drafts and alternate poses of Hugo, including one where he had tree limbs for arms(!). Though I agree with the artist’s final choice as the best concept, I loved seeing these “roads not taken”, which feature some great expressions from the subject. Finally, the long-awaited but never-properly distributed 70s gangster yarn The Key Man has finally surfaced in odd quadrants of the internet, suggesting it may yet see the light of day in the US, probably via VOD. 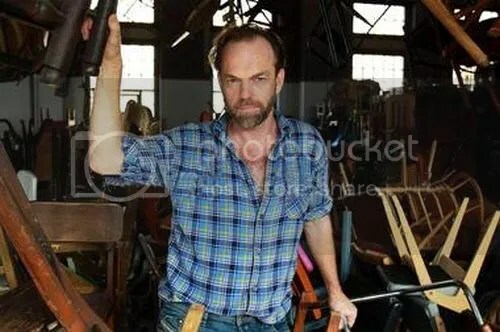 Some background, for fans who don’t know the whole, strange story: Hugo Weaving filmed The Key Man for director Peter Himmelstein in 2006, in North Carolina. It was a US indie film costarring Brian Cox, Judy Greer and Jack Davenport, and the plot centered on Davenport’s character being drawn into a scam concocted by gangsters played by Weaving and Cox. After years in limbo, it finally surfaced at the 2011 SXSW Festival in Austin, where it got mixed reviews, though Hugo drew mostly raves. But it’s never been commercially released in any major markets. I’ve seen dozens of links to bootlegged versions, most of which are either poor quality (based on the screencaps shown), “shot with an iPod camera” (by the pirate-site’s admission) or a different film with the same title. I can’t vouch for any of these sites because they’re a great way to download viruses, malware or adware, and because no one seems to have a quality copy… if this was one of Hugo’s obscure, decades-only miniseries or guest-shots which stands no chance of a legal DVD issue anywhere, and had no clear copyright provenance, I might have a different opinion. But clearly there ARE legal, quality copies available for viewing in some parts of the world, so I recommend patience. And bugging Netflix and the film’s distributors (Occupant Films, K5 Independent) couldn’t hurt. After I passed on the minimal info I had about legal VOD distribution, Elisa at Random Scribblings passed on the info and was contacted by someone with a Polish-dubbed bootleg of the film, which she screencapped for the website. Since I haven’t seen the film properly, I don’t really want it spoiled through a “flip-book” image-only version… I love screencaps after I’ve seen a film, but not before. And since I’ve been patient this long, I’ll continue to wait for the distributors to get a clue and make this film available legally to the fans who’ve been waiting so long to see it. Finally, there are reviews and DVD/BluRay extras details about the Cloud Atlas US DVD from Washington Post and SciFiMafia. The US DVD finally comes out May 14.